Back in February I started taking the Wilton Method classes at my local Michaels. You can also take them at JoAnn's or Hobby Lobby. I tool course two and then wanted to take course 3 but no one else signed up so then I ended up doing both course 2 and 4 in March. It was a busy Month. Course two was making all kinds of flowers out of royal icing and then we did the basket weave as well on a cake for the last class. Click here to see my cake. Anyway the course 4 is advanced gum-paste and fondant, which really is just gum-paste. 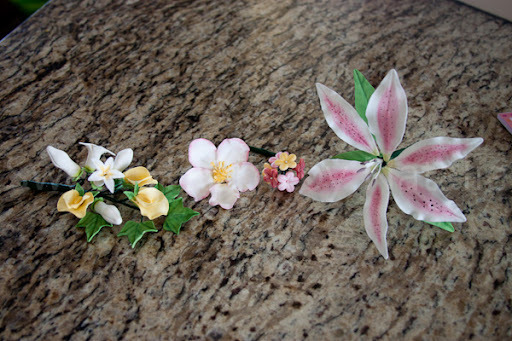 We made all these flowers below and then on the last class wired them together. The flowers are edible not sure I would want to make these for cakes, just buying fresh ones would be easier and cheaper for a customer to have on a cake! 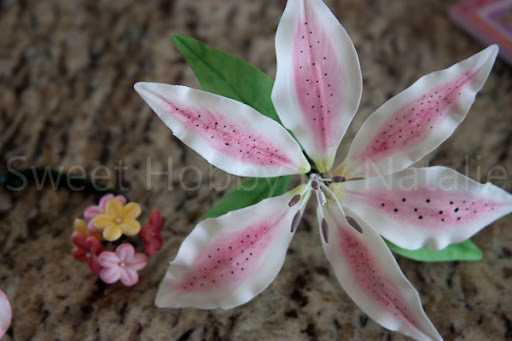 Gum-paste can be pretty fragile especially with these flowers because you have to roll them out pretty thing. 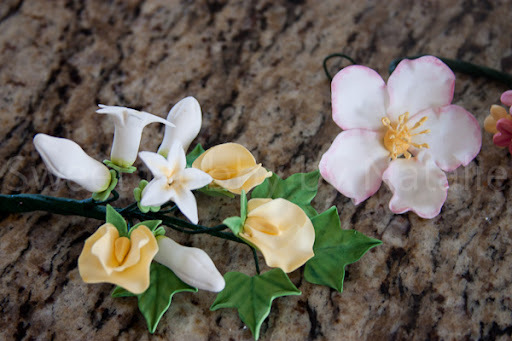 You can see on the flower on the right one of my petals broke when I was trying to add it too my corsage.